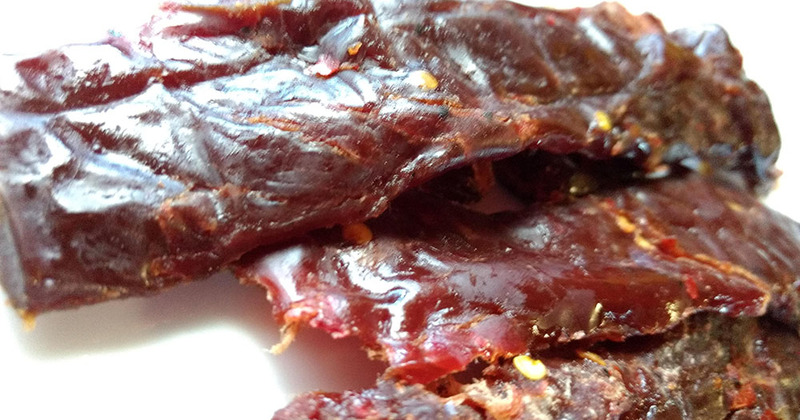 Next in the series on Jerky Hut this is Hot Teriyaki Beef Jerky. This Hot Teriyaki is also dubbed, "Mooie Looie", and according to the company, is made from prime cut, thick slices of beef, seasoned with a touch of crushed red chilies and Chinese Hot Mustard. Beef, brown sugar, water, teriyaki sauce, teriyaki seasoning, onion, garlic, dextrose, sodium erythorbate, sunflower oil, disodium inosinate, corn syrup solids, mustard powder, crushed chili peppers, garlic powder, black pepper, sodium nitrite. The first thing I taste from the surface of these pieces is a moderate sweetness and light saltiness. A light teriyaki starts to show, and a little bit of heat builds. The chewing brings in a bit more teriyaki definition, while shades of garlic drift in. A light touch of chile pepper flavor sits in the background. For being labeled, "Hot Teriyaki", it's not actually hot, more like lightly spicy. The crushed chili peppers in this adds just a bit of heat, enough to be noticed, but not enough to do much with. I'd still rate this as "mild" on our heat scale (level 1 out of 5). The teriyaki itself remains a light flavor, and has the sweet and soy sauce components, while the ferment and ginger seem lost. Otherwise, the primary taste profile is a light teriyaki sauce, mostly sweet with soy sauce, with hints of garlic and touches of red chile pepper flavor. The saltiness remains moderate. While easy to bite through and easy to chew, this meat tends to feel mushy in texture, not really steak-like. I do find light stringiness, though nothing unchewable. The extra sweet leaves the surface sticky and you'll want to keep a paper towel handy if you're typing on a keyboard or channel surfing the television. 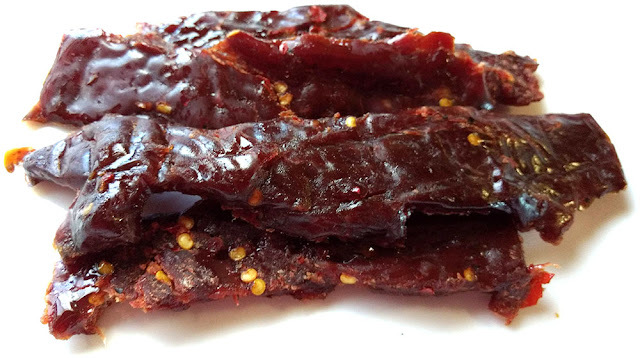 This Hot Teriyaki Beef Jerky from Jerky Hut delivers a low level of heat with a mostly mild teriyaki sauce flavor. The heat is low enough that spicy food lovers might think they bought the Mild variety by mistake. 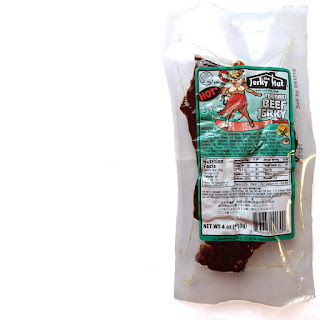 The teriyaki flavor itself is strong on the sweet and soy sauce, but lacks in the ferment and the pungent spice contrast which may cause teriyaki-traditionalists to see this mostly as a sugary soy sauce jerky. The chewing texture is mushy, and not really all that steak-like. Otherwise, it's an easy chew that gives off a familiar teriyaki flavor and a low level of heat that most audiences should tolerate.